The Tournament Directors want to thank all of the participants in this event. It was a challenge from the beginning. The two clubs that ran their tournament added to the stress that already existed due to the weather, off site parking, and lack of space at the ramp. Despite these challenges, there were no major infractions before, during, or after. THANK YOU! Even with typical R & B weather and 60 boats on the water, 14 of the 37 teams brought limits to the scales. Not only can we boast great fishermen, but great people. 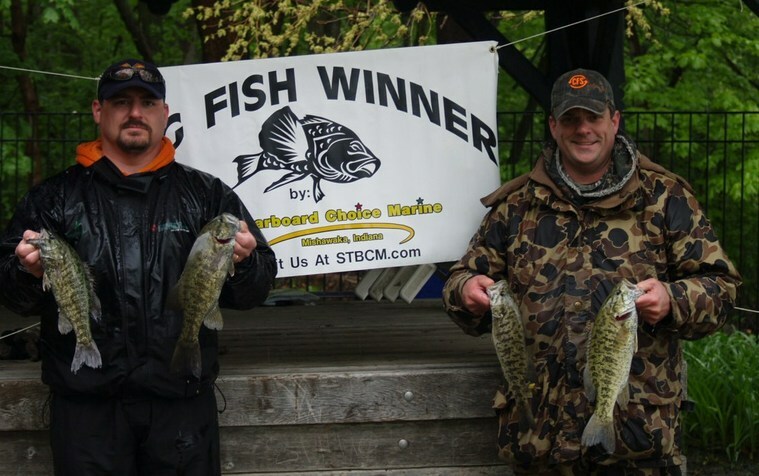 1st Place: Travis Schroeder and Tom Reed won the second closest tournament in R & B history by .33 pounds. Reed exclaims, "We got lucky." But luck meets the prepared angler and the winners were prepared with 15 minutes remaining in the tournament. 2nd Place: Rich Patton and Dave Morrow used 2 tools to fool mainlake spawning fish to weigh a limit of 9.58 pounds and win $426. 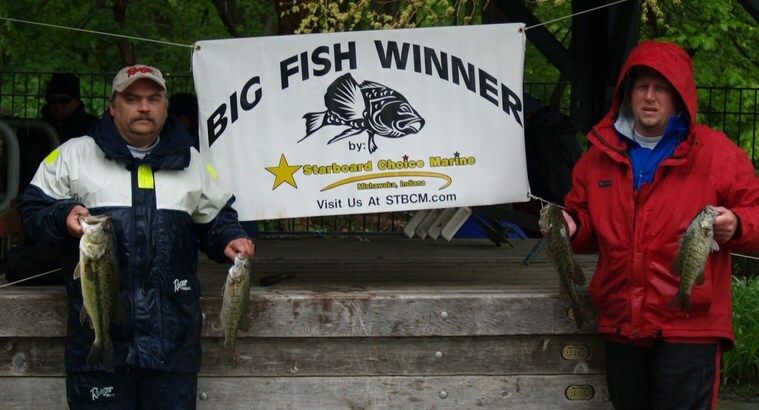 The team weighed 4 smallmouth and 1 largemouth. All fish were caught off of their beds. Exploiting beds was their game plan. They spent considerable time looking for fish on beds, but the weather made it difficult. Yet, they still managed 9 keepers. They aggravated the fish into biting by tossing Erie darters and Schubert's tubes. Both were attached to 3/16 ounce jigheads and both in the green pumpkin color. 3rd Place: The 2010 Points Champions Aaron Hochstedler and Bobby Nelson have wasted no time establishing themselves as serious contenders to repeat as champions. The champions finished 6th place at Lake Manitou and followed that up with a 3rd place finish at Maxinkuckee Sunday. This places them solidly in 2nd place in the Standings. 5th Place: After winning the first event on Lake Manitou, there was only one way to go: down. But Teddy Bradley and Mark Fennell didn't like that option or philosophy; so they aimed for another win. They nearly pulled it off. They spent Saturday afternoon scouting and searching for a winning pattern. They found several bedding fish in the channels and a few on the mainlake. On Sunday morning, they began in the channels and caught their limit early. In all, they caught 7 keepers there, including their 2 biggest. But they improved their sack by catching 3 smallmouth on the mainlake. 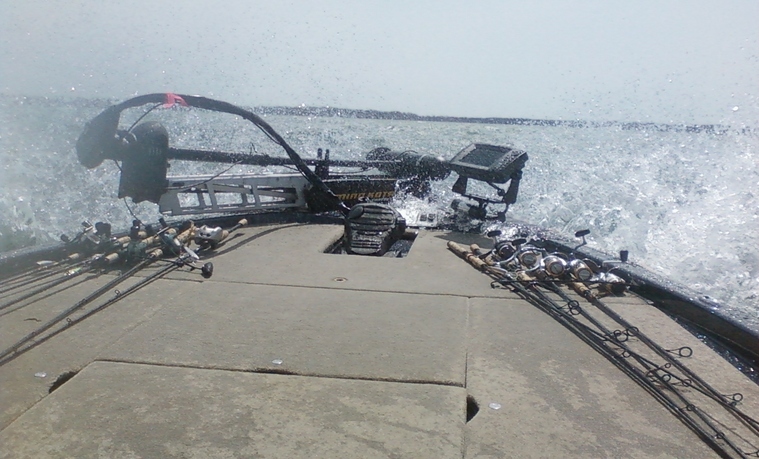 In the channels, the team tossed senkos while on the mainlake, they tossed D's tubes and Erie Darters. They won $136. 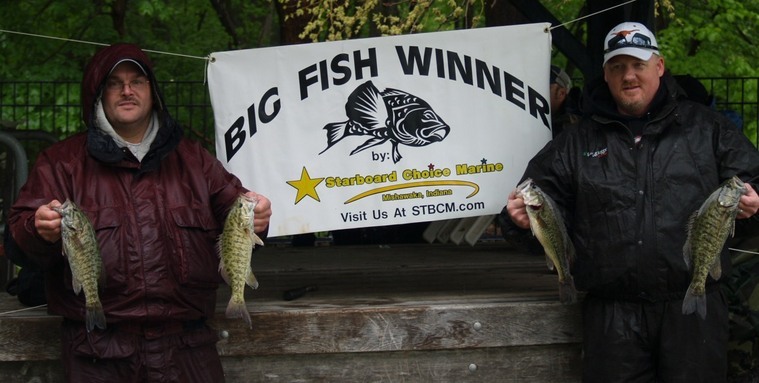 4th Place: Greg Mangus and Kevin Fletcher caught 20 keepers and their best 5 weighed 8.82 pounds. They won $194. They caught all of their fish with junior Erie darters matched up with 3/16 jigheads. They found the bigger fish relating to taller patches of sand grass. The team got bites all day, but in the last hour they had their best luck. During that stretch they located a very small area that produced their best 5 fish. 6th Place: Tony Kaser and Jason Dittmar are in the money for the second straight event and find themselves in the top 3 of the Standings. This time they won $118. 7th Place: For the second straight time, Jason Horvath and Trevor Paulus claimed this spot to win some cash, $98, but they also find themselves in the top 5 of the Standings. D's Lures Award: This prestigious award went to Bob Johnson and Ron Guthrie. 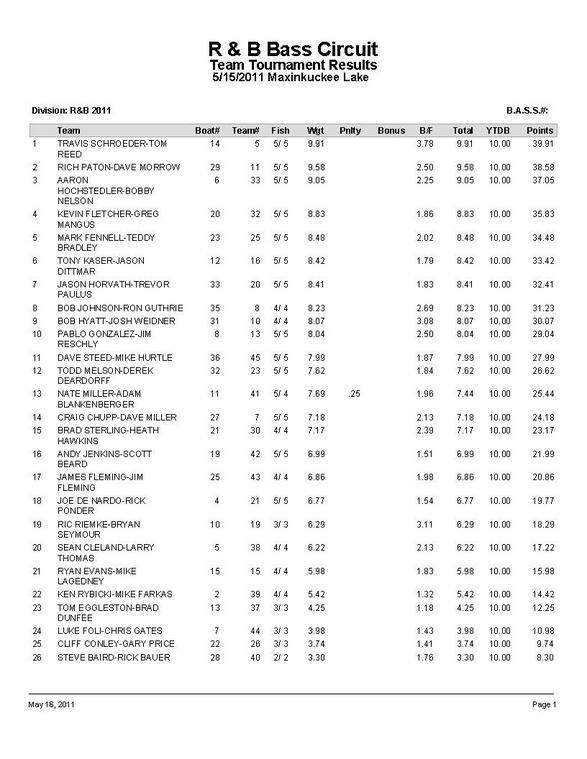 After claiming 3rd at Manitou, the team also find themselves in the top 5.
thereafter. But they had gotten some bites on Yamamoto hula grubs paired with light jigheads and were convinced that would still produce. It did. The Starboard Choice Marine big bass, a 3.78 pound largemouth, fell victim to the jig and then another lofty largemouth was fooled. The 2 fish bit within moments of each other. 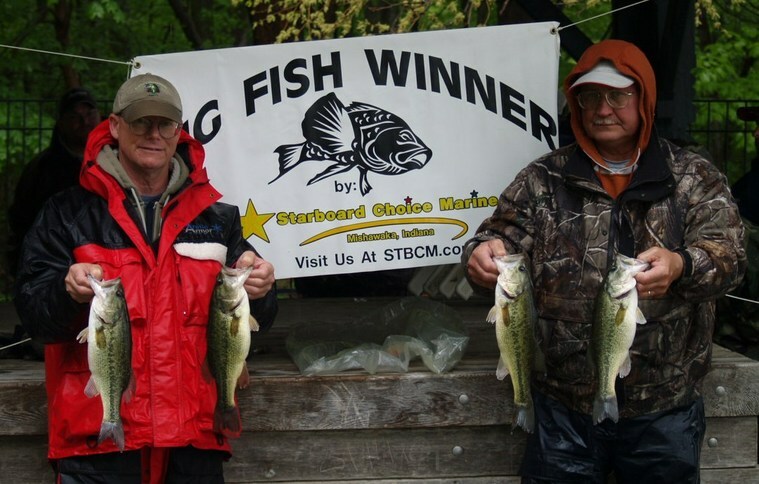 Their limit weighed 9.91 pounds and earned them $700, but the big fish earned them another $370, making their total winnings $1070. The winners spent the day holding their boat in 7 foot of water while casting as shallow as 4 foot and as deep as 12 foot. They moved around to 7 different spots on the lake, but only 2 of those produced keepers. Like last year at Maxinkuckee, they tossed Mizmo tubes between 4-6 foot of water. But unlike last year when they tossed chartreuse tubes, this year they threw green pumpkin. 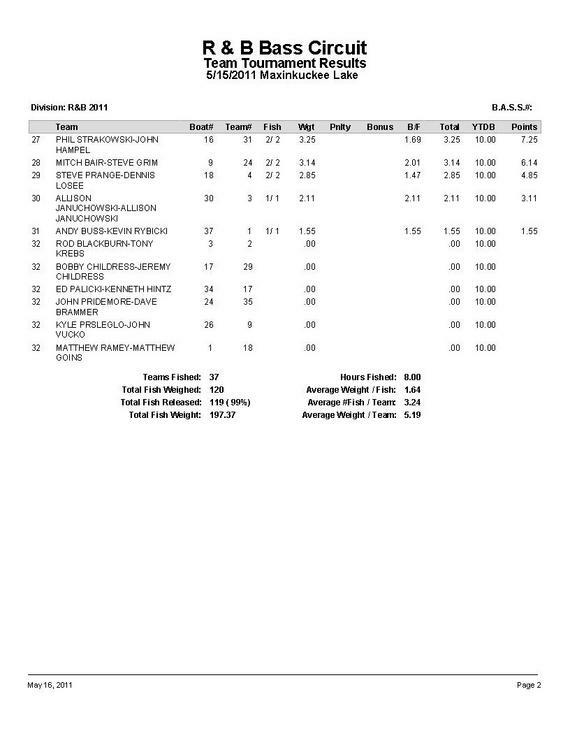 The team caught the majority of their fish early and then again in the last hour of the tournament. They culled 3 times to improve their sack. This earned them $272.